Enterprise activities are not for all nongovernmental organizations (NGOs), nor are they easy for those NGOs that do venture into the marketplace. 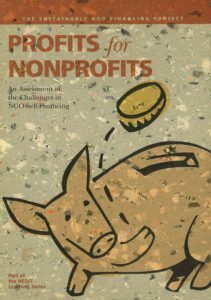 Profits for Nonprofits examines the practical challenges and obstacles in implementing self-financing. The 20 Central European NGO enterprises documented in Profits for Nonprofits have not succeeded without significant effort, risk and sacrifice. The cases illustrate that management, access to credit, conflicts between for-profit and nonprofit mission, legal, tax and regulatory issues, potential fallout and competition with for-profit small-businesses, public accountability, ethics and potential abuses are all recurring issues that the NGOs face in using self-financing strategies. However, Profits for Nonprofits illustrates that, while not the panacea, self-financing can generate income and further the mission of nonprofit parent organizations. ← Čo by urobil Google?